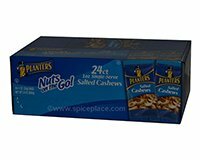 Contains 24 individual 1 oz packages of Salted Cashews. Allergy Information: Manufactured on equipment that also processes peanuts and other tree nuts. May contain peanuts, and other tree nuts.